Demonstrated a record of community service or working for the public good, either through a full-time professional role or significant engagement outside of primary employment. English Language Requirements: Test of English as a Foreign Language (TOEFL) scores are required for international students. The Harris institution code is 1849 or 1832. Both codes will be accepted. You can make your reservations to take the TOEFL with ETS directly. Transcripts: You may submit unofficial transcripts through the electronic application process; however, official transcripts will be required upon admission for enrolling students. Please submit transcripts for all prior academic work from any institution of higher education. Work Experience: Please include current and prior positions, preferably demonstrating 3–5 or more years of work experience, the nature of your job, and responsibilities. You may upload a current resume reflecting this information along with your education, community service, professional honors, and any other relevant information. Letters of Recommendation: University will prefer to have at least one reference from a previous professor who can speak to your academic background and preparedness for graduate studies. Those making a recommendation should submit letters through the electronic application—hard copy letters will be accepted but are not preferred. Short Essay Responses: Tell us about your current work (which may be your paid employment or your significant volunteer activity. In answering, please describe the concrete impact – however you define impact – your current work is having. – Why have you chosen this work? – What impact do you want to have on the world? – How would becoming an Obama Foundation Scholar help you achieve this? – What do you plan to do after the Obama Foundation Scholars Program? 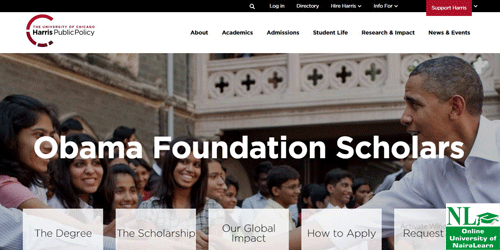 1 responses on "Apply For Obama Foundation Fully Funded Scholarship Program in USA 2018"